Many of the aches and pains we see in clinic are due to the repetitive and poor nature of the postures we adopt in the workplace. Many people spend large parts of their working day sat at a desk. An incorrect workstation set up and the poor postures adopted on them are responsible for a large percentage of the spinal aches and pains we treat. We can provide a Level 2 DSE assessor, capable of carrying out workstation assessments. 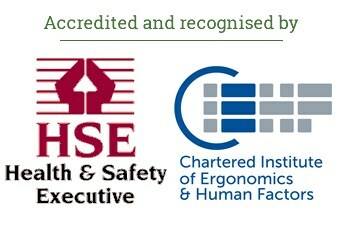 HSE (Health and Safety Executive) accredited and recognised consultants by the Chartered Institute of Ergonomics and Human Factors (CIEHF). We can offer one-off desk assessments or multiple checks. A detailed workstation assessment of the equipment and immediate working environment. A report for the individual and employer covering any risk factors identified and any actions required. A working observation of the user completing the required tasks at their workstation. A thorough, clinically relevant history in relation to the problems experienced at the workstation. A detailed report for both the individual and the employer outlining any risks and changes that should be made. Postural advice and exercises to assist desk based problems. Possible follow up sessions in clinic may be suggested to address larger ongoing problems.